The award winning traditional brat is full of flavor that everyone will enjoy. The spice profile will make you want another. Perfect over the fire, grill or heated in the microwave! 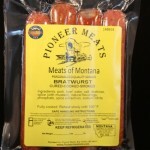 Brought to you by Pioneer Meats in Big Timber, Montana.